Tverskoy Boulevard is the oldest and longest street in central Moscow. 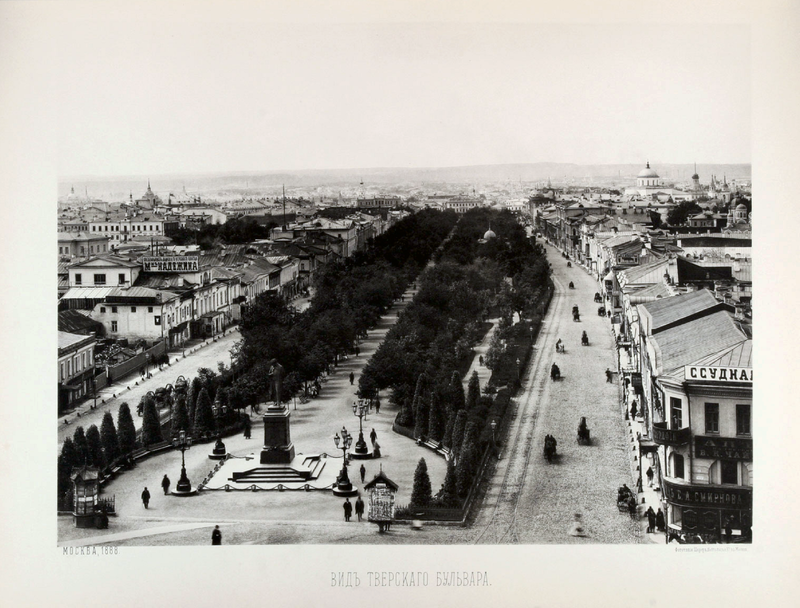 For some two centuries, the neighbourhood called Bely Gorod (White Town) formed part of a defensive belt around the capital until, in the eighteenth century, the crumbling walls were taken down and replaced with large boulevards. Laid out in 1796, Tverskoy was the first of those and quickly became popular with Moscow’s aristocracy. In 1812 the boulevard changed dramatically in character when Napoleon’s armies entered Moscow. Soldiers set up their tents along the street, cutting down most of the trees for firewood. However, no permanent damage was done. Although new avenues were laid out afterwards, Tverskoy remained popular and was simply known as ‘the boulevard’. Soviet art and architecture have been responsible for acts of severe vandalism, but the historical Tverskoy Boulevard has remained relatively well preserved. Architects and urban planners designed parts of their typical massive office blocks to stand back from the street to maintain the line of historic façades. Many of the buildings have their own story to tell. 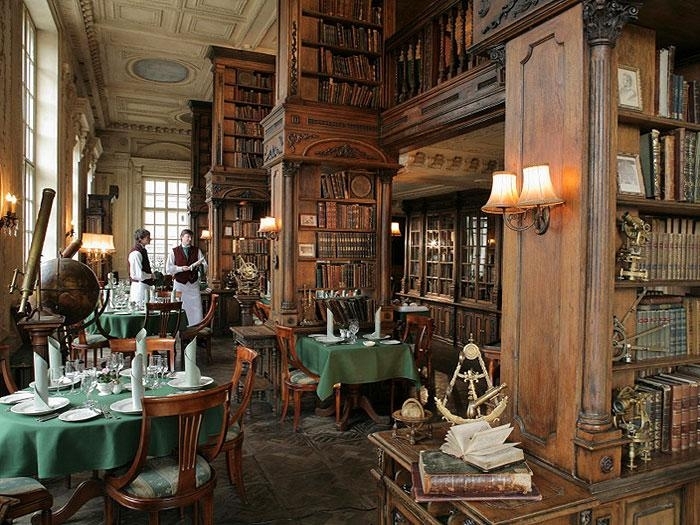 The famous Café Pushkin is located at no. 26a of the Boulevard. 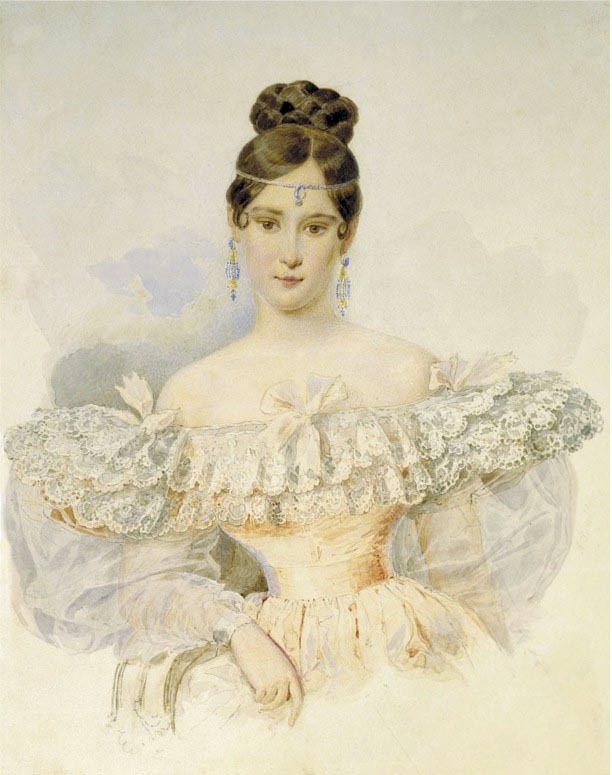 What is now known as the Gorky Moscow Art Theatre on the boulevard was originally the site of a mansion where young Alexander Pushkin met his future wife Natalya Goncharova at a ball in 1828. This first meeting was the beginning of a love affair that tragically ended with Pushkin’s death in a duel. In June 1880, the first monument to Alexander Pushkin was unveiled. Sculpted by A. M. Opekushin, it was immediately recognized as a masterpiece and a spiritual symbol of Russia. For a long time the statue was located in Tverskoy Boulevard until, in 1950, it was moved to a new place because the former Strastnaya (now: Pushkinskaya) Square was being reconstructed. The monument was moved to its centre, to the place of the former bell tower of the Strastnoy Monastery which was destroyed in 1937 together with a number of other local churches. The monument portrays the poet immersed in thought. It makes Pushinskaya Square justifiably one of the most representative places in Moscow. After all, Pushkin was a Muscovite by birth and, poetically, expressed a profound love for his home city. The lateral sides of the pedestal bear famous lines of his poem ‘Exegi monumentum’. 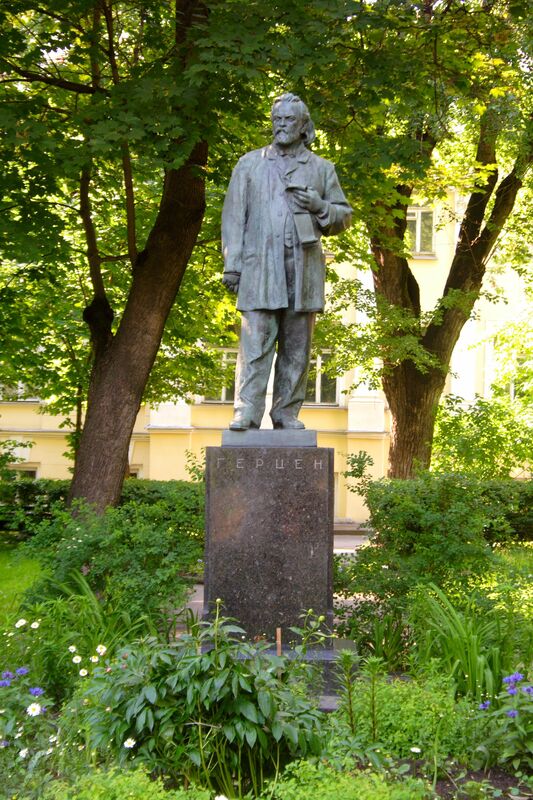 Another statue in the Tverskoy Boulevard is that of socialist philosopher and author Alexander Herzen who was born at no. 25. Known as Herzen’s House, it soon became a centre of literary and artistic life in Moscow. Osip Mandelstam lived in a modest room of the building during the late 1920s and 1930s. A memorial plaque of the poet (by Dmitry Shakhovsky) was inaugurated there in 1991 in celebration of his 100th anniversary. In 1995, another statue was unveiled there, this time in honour of legendary poet Sergei Yesenin who gave a number of famous readings at Herzen’s House. Although he was Russia’s most popular poet and had been given an elaborate funeral by the State, most of his writings were banned by the Kremlin during the reigns of Stalin and Khrushchev. Only in 1966 were most of his works republished. Between 1889 and 1928 Tsarist and Soviet theatre star Maria Nikolayevna Yermolova lived on the Boulevard. She was hailed as the greatest actress in Russian history and, in 1921, the first person to be proclaimed the ‘People’s Artist of the Republic’. Following her death, her Tverskoy flat was designated a national monument. The same neighbourhood hosts the headquarters of Russia’s major news agency, Itar-Tass (founded in 1902), constructed in the 1970s. Its trademark giant windows have been inspired by a series of Soviet propaganda posters that were typically displayed in windows. In painting the ‘traditional’ and ‘aristocratic’ Tverskoy Boulevard has been an inspiration to modernist artists in particular. Igor Emmanuilovich Grabar was a post-Impressionist painter, publisher, and art historian. 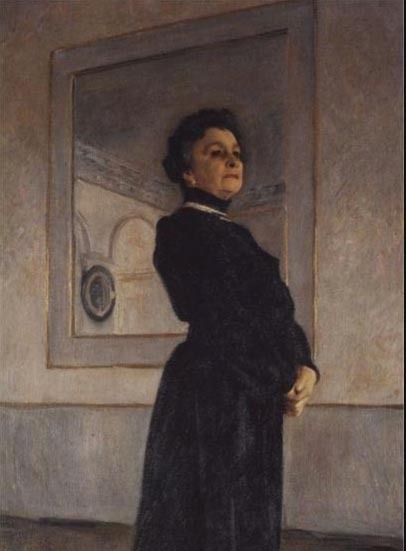 Creatively, he reached his peak in painting in the period between 1903 and 1907. His work was notable for a peculiar divisionist painting technique and his rendition of snowy scenes. One of his early paintings dates from around 1880 and is an oil on canvas entitled ‘A Moscow Street, Tverskoy Boulevard’. Cityscapes in a similar tradition were produced by Konstantin Yuon. He too was inspired by French post-Impressionists and their interest in the city. Among his urban scenes are ‘The Tverskoy Boulevard’ (1903) and ‘The Night Tverskoy Boulevard 1909’. The most remarkable rendering of the boulevard however was Aristarkh Lentulov’s 1917 cubo-futurist image of ‘Tverskoy Boulevard’. The latter had lived in Moscow from 1909, and he was one of the founders of the avant-garde exhibiting association of artists named the Jack of Diamonds. The group became the most significant exhibition societies of the early Russian avant-garde and remained active until its dissolution in 1916. 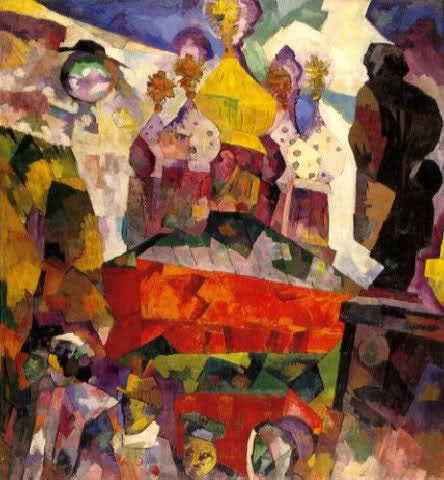 Between 1910 and 1911 Lentulov studied at the Le Fauconnier studio and the La Palette Academy in Paris. 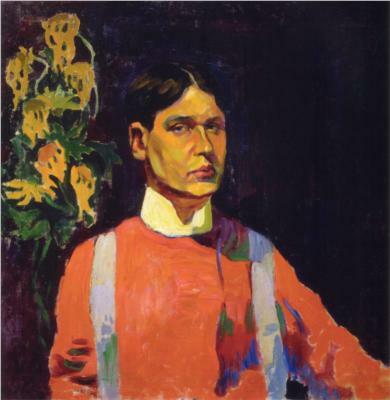 Whilst there, he became acquainted with contemporary French modernists and absorbed the new tendencies of Fauvism and Cubism before developing his own unique colourful style of painting. He was instrumental in pushing forward the avant-garde movement in Moscow and influenced such masters as Kandinsky and Malevich.